"Herbicide-resistant crops….are clearly not the only culprit and, likely, not even the primary culprit: Not only did Monarch and milkweed declines begin decades before GM crops were introduced, but other variables, particularly a decline in the number of farms, predict common milkweed trends more strongly…." There is intense scrutiny over the role that GMO crops (and, by extension, herbicides glyphosate and dicamba) often paired with them play in the health of the Monarch butterfly. Butterfly population declines are often blamed by activists and some scientists on farmers using herbicides to destroy milkweed — a poisonous weed that severely damages crops but is a critical food source for butterfly caterpillars — growing near their GMO crops. The issue is complex with researchers differing on the causes of the decline. Recent research, out of Cornell University, suggests herbicides have played an insignificant role in the prior decline. The insect is facing problems that appear to be more complex than a single culprit. Research suggests the Monarch faces numerous threats, most of them unrelated to the use of herbicides, including climate change and degradation of their overwintering habitat in Mexico. 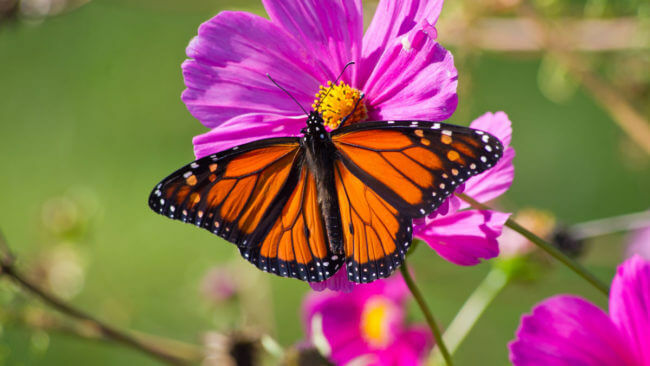 A review of 116 years of data published in 2019 in the Proceedings of the National Academy of Sciences concluded that agricultural practices, including the use of herbicides, are responsible for less than 20 percent of the monarch decline. The plight of the Monarch has been well documented in recent years, with the population of the migratory creature plunging dramatically. 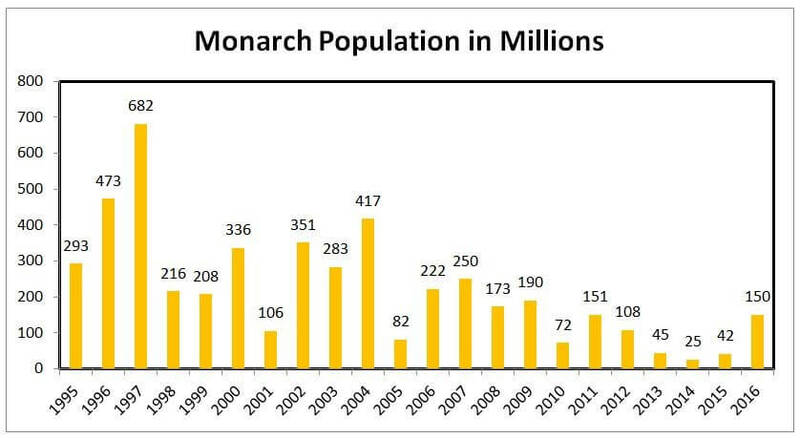 The Monarch suffered an 88 percent decline in North America from 1999 through 2012, but its numbers have rebounded since, although they are still down considerably over the past 20 years. According to the independent Illinois Butterfly Monitoring Network, the population in 2018 reached the highest levels of the past 25 years, and the fourth highest level since 1993. The number of butterflies heading south to Mexico may reach as many as 250 million over the 2018-19 winter. At its peak in the 1990s, the population reached an estimated 900 million. Before exploring the reasons for population reduction, consider the life of the insect. Each year, the Monarch makes a 6,000-mile round-trip journey that spans multiple generations. They mate in Mexico in the spring, before traveling to northern Mexico and some places in the very southern US, where they lay eggs on milkweed plants. The parents die there, but their caterpillar offspring feed on the milkweed, before traveling north to Canada, where another generation is born. These unmated butterflies then return to Mexico for overwintering, eating nectar, rather than milkweed, along the way. Karen Oberhauser, a conservation biologist at the University of Minnesota, and a colleague estimated that as Monsanto’s Roundup Ready corn and soybeans spread across the Midwest, the amount of milkweed in farm fields fell by more than 80 percent. Oberhauser determined that the loss of milkweed almost exactly mirrored the decline in monarch egg production. Anti-GMO activists have seized upon the narrative, arguing that the Monarch’s problems are one more reason why GMOs (and associated herbicides) should be feared. Glyphosate is one of the very few herbicides that kills common milkweed and is particularly effective when sprayed later in the season on Roundup Ready corn and soybeans. The devastation extends beyond milkweed. Flowering plants that provide Monarch adults with nectar are also under siege from increasing herbicide use and drift. Next-generation genetically engineered crops resistant to volatile herbicides as well as glyphosate will dramatically exacerbate these impacts. Because most wildflower habitat is found near corn and soybean fields in the Midwest, increased herbicide use and drift will reduce nectar resources that monarch adults require for breeding and for their epic migration. With most pesticides, the damage is delayed and it’s harder for people to make the connection between pesticide use and harm,” Donley said. “But with dicamba, you can actually see the damage in real time. I hope this is a wake-up call to the EPA and the farming community. Most scientists, however, suggest there is far more at play in the Monarch’s decline than a patchwork loss of milkweed. The most respected researcher team in the world is headed by Anurag Agrawal at Cornell University, author of a well-received best-selling 2017 book, Monarchs and Milkweed: A Migrating Butterfly, a Poisonous Plant and the Remarkable Story of Their Coevolution. His research team at Cornell addressed the milkweed-herbicide connection in a 2016 study, examining 6,000 migratory reports by butterfly watchers between 1993 and 2014. 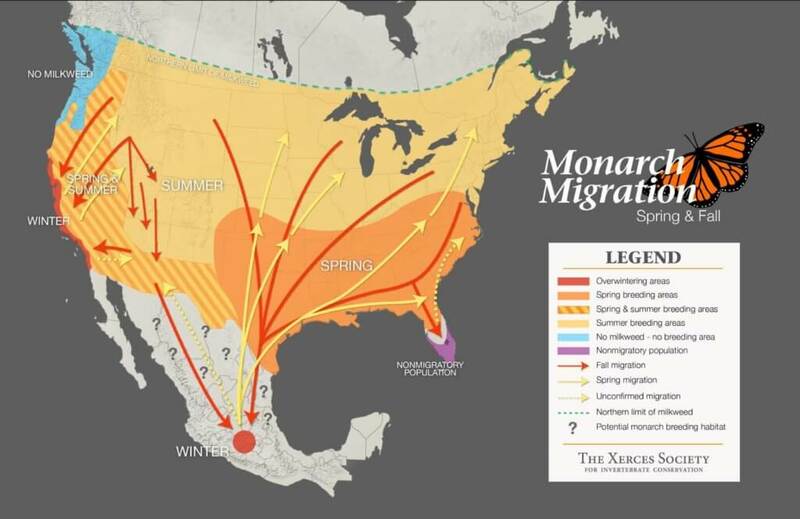 The monarch butterfly is far from being threatened, but the eastern USA migration, one of the most spectacular animal migrations in the world, may be an endangered phenomenon. To identify and manage the risk factors associated with its decline, deeper critical analyses of the existing data are essential. We do not dispute that milkweed is essential for larval monarchs, and might serve as a buffer against further aggravation. Yet our analyses indicate that other stages are critical, so milkweed conservation alone is unlikely to be sufficient to preserve the migration. Additional resources are necessary to study and improve the transition between summer breeding in the USA and overwintering in their highland forested habitats in Mexico. “The consistent decline at the overwintering sites in Mexico is cause for concern. Nonetheless, the population is six times what it was two years ago, when it was at its all-time low,” Agrawal has said. He credits the population rebound to improved weather and release from the severe drought in Texas. In fact, there is almost no Monarch breeding going on in the United States and Canada close to areas where they lay their eggs. The decline in Monarchs happens in two places where glyphosate is not an issue: in overwintering grounds in Mexico (where it’s not used) and as their adult forms fly back to Mexico (when they no longer feed on milkweed, instead preferring nectar). 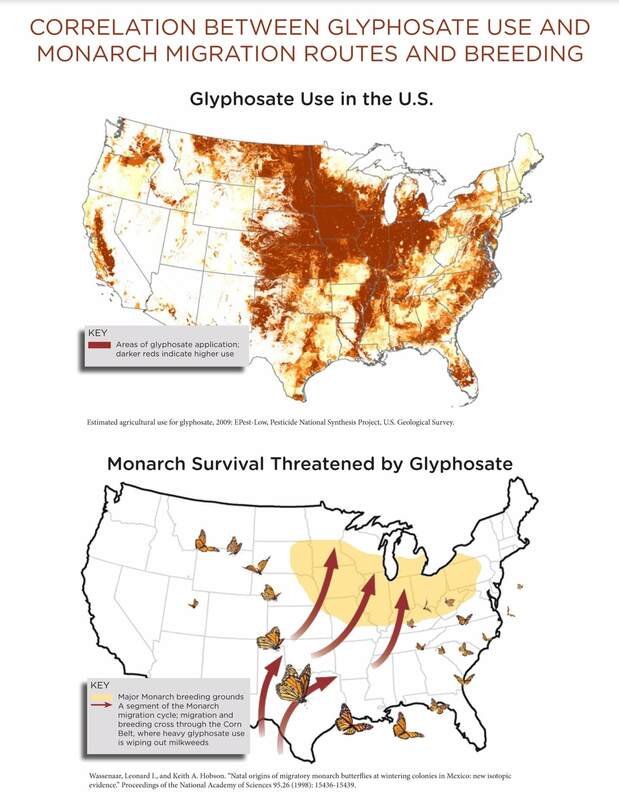 Monarchs fly over areas where glyphosate (and other herbicides) are used on corn and soybeans. But if Monarch caterpillars aren’t raised in those areas, then banning these herbicides or dramatically increasing the milkweed populations of the entire Midwest, from Oklahoma to Saskatchewan, won’t help the butterfly. A February 2019 study published in the Proceedings of the National Academy of Sciences (PNAS) provided further evidence that GMO crops and herbicides often paired with them are not driving the decline in Monarch butterflies. The researchers used digitized records from museums and herbaria around the US to track changes in Monarch populations and milkweed between 1900 and 2016. Whatever factors caused milkweed and monarch declines prior to the introduction of GM crops may still be at play, and, hence, laying the blame so heavily on GM crops is neither parsimonious nor well supported by data. The two most recent state-of-the-art studies on the health of the Monarch’s, from Cornell and the NAS, each concluded that GMOs and herbicides are unlikely to be driving the decline in the butterfly’s numbers. Blaming genetic engineering ignores a host of other factors likely in play, researchers have unanimously concluded. … scientists and non-scientists alike [are coming] to realize the true complexity of the problem. When a species has a life cycle as complicated as that of the monarch butterfly….it’s very difficult to put a relative importance to the various dangers it faces. But Agrawai and other scientists note that the increased usage of weed-killing herbicides may have contributed to or exacerbated the Monarch’s challenges since the 1990s, and they urge more research.